MUMBAI: Television actress Shrenu Parikh, known for shows like Ishqbaaaz and Iss Pyaar Ko Kya Naam Doon?...Ek Baar Phir, expressed her anguish over Indian cricketer Hardik Pandya’s sexist statements on the show Koffee With Karan. The sixth season of Koffee With Karan, which is hosted by Karan Johar, saw Indian all-rounder Hardik Pandya and batsman K L Rahul as guests. 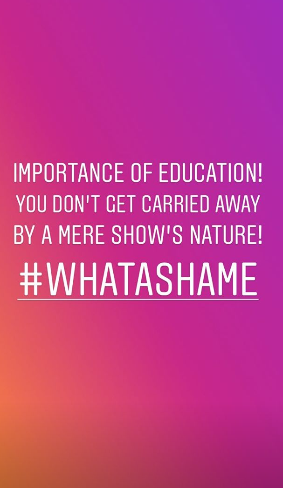 As a part of the show, they were asked several questions by Karan, and Hardik was seen boasting about sending the same texts to multiple women and hooking up with multiple women. On the show, he also said how he informed his parents that he lost his virginity in a funny manner. Hardik’s controversial comments did not go down well with the public, and Twitterati slammed him for his words. The cricketer later apologized for making such statements. It seems actress Shrenu did not like Hardik’s excuse. According to latest reports, Hardik Pandya and K L Rahul have been suspended.